More than three-dozen federal facilities in Southeast Texas closed due to Harvey, according to federal officials, forcing employees to take leave, work remotely or in some cases, fight through the storm to perform mission-critical work. Harvey has wrought serious destruction and record flooding since it made landfall as a hurricane Aug. 25, bringing with it heavy winds and days of historic rainfall. Agencies have deployed 8,500 employees from around the country to contribute to response efforts, but nearly 60,000 feds live and work in the region impacted by the storm. The General Services Administration has coordinated the closure of federal offices, while the Office of Personnel Management has worked with Houston and San Antonio’s federal executive boards to answer human resources questions for affected agencies. Many employees have continued to work remotely, when possible, while agencies have placed others on hazardous weather administrative leave. Several agencies said they plan to reopen their offices and transition back to normal operations on Sept. 5, after Labor Day. LeAnn Jenkins, who as the head of Houston's Federal Executive Board has coordinated with agency leaders to distribute information about closures and emergency services, said that will not ensure all employees can go back to work. "Even if the buildings are something they can get into, they can’t get to them," Jenkins said, noting that many roadways are still flooded. She added that some employees "are still waiting for water to recede from their homes so they can figure out what the damage is and what they need to do." OPM has given agency leaders the authority to provide employees with flexibilities such as unscheduled leave, which Jenkins expects supervisors to use liberally. "They understand," she said. "They know the employees have a lot on their plate." NASA: The agency closed the Johnson Space Center on Aug. 25, but it could not send all employees home. NASA had to keep the International Space Station operational and keep staff on to maintain the James Webb Space Telescope, which is at the center for testing. So, 125 personnel stayed behind to work throughout the storm. Control rooms not actively supporting mission-critical work were set up with cots, said Kelly Humphries, a Houston-based spokesman working remotely during the closure, and employees were provided with Meals Ready to Eat. Some of the 125 employees have been swapped out as they prepare for a Russian spacecraft to disconnect from the international station and land in Kazakhstan on Saturday. Most of the rest of the thousands of employees reporting to Johnson have been afforded liberal leave policies, while some have continued to work remotely. The station is scheduled to reopen Sept. 5, though Humphries said NASA expects a “transition to normal operations” rather than an immediate restart. Veterans Affairs Department: The Michael E. DeBakey VA Medical Center has remained open throughout the storm, despite just 14 percent of its normal staff reporting to work. About 700 employees of the normal 5,000 have been on site since Harvey hit last Friday to keep the hospital operational, according to Jessica Jacobsen, a department spokeswoman. Some of those employees had not been home since the storm hit. VA has sent nurses and other medical personnel from Dallas, as well as Central and South Texas to augment the staff in Houston. VA police officers, staff and volunteers guided an 18-wheeler truck on a circuitous route around gaps in the flood waters to deliver emergency food supplies to the hospital and helped to unload it. In one case, the hospital’s medical case was able to perform surgery on a veteran with prostate cancer suffering from serious abdomen pain after he had waded through 2 miles of flood water to reach the facility. Harvey forced VA to shutter four “vet centers,” which provide veterans with readjustment counseling, but the department sent down a mobile vet center to provide services. It also closed down the Houston VA Regional Center, but many employees were able to continue working due to telework agreements already in place. “They’ve never stopped processing veteran claims,” Jacobsen said. The rest of the VA staff in the area—those unable to work remotely—have been on administrative leave. The regional center, as well as the VA-managed Houston National Cemetery, both reopened on Thursday. National Park Service: NPS manages two federal parks in Harvey’s path, Padre Island National Seashore and Big Thicket National Preserve. Both were closed in advance of the storm, but Padre Island has already reopened. The park sent its employees to posts in San Antonio and Brownsville, Texas, with their computers and other equipment before Harvey hit as part of its continuity of operations planning. The damage there was less than expected, said Patrick O’Driscoll, a spokesman for NPS in the region. Some employees stayed behind to, once it was safe, to patrol the beach and remove hazardous material. Big Thicket received between 30 and 40 inches of rain, O’Driscoll said, leaving the park “completely inundated.” Most of the staff there has worked from home and continues to do so, though it expects to reopen on Friday. The law enforcement staff at the preserve were deployed to help other jurisdictions with search and rescue efforts. Housing and Urban Development Department: HUD’s Houston field office remains closed. To ensure continuity of operations, the department passed off the office’s responsibilities to other employees in San Antonio and Fort Worth, Texas. HUD Secretary Ben Carson joined President Trump as he visited response centers in Texas on Tuesday. Some HUD employees teleworked during the storms, but others had more pressing priorities. 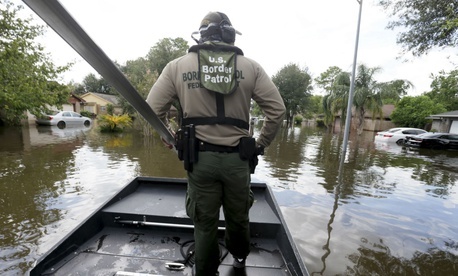 Fish and Wildlife Service: FWS closed a dozen refuges and offices in Texas and Louisiana. About three-quarters of its 231 employees in the region, all of whom have been accounted for, are on administrative leave. The facilities remain inaccessible and unsafe, said Beth Ullenberg, a spokeswoman in the area, preventing the agency from even evaluating the damages that have occurred to the facilities, structures and habitats. It will begin that work as soon as it is safe to do so. Small Business Administration: SBA closed its Houston office during the storm and will reopen Sept. 5. Most employees have been on administrative leave, and either began teleworking Thursday or were converted to unscheduled leave. Some employees at the SBA Houston have been “very busy” throughout the storm, agency spokeswoman Carol Wilkerson said, coordinating with its disaster office to set up Business Recovery Centers. SBA Administrator Linda McMahon also visited Texas with Trump this week, promoting the agency’s loans available to home and business owners. Commerce Department: The federal building in Houston that houses the U.S. Export Assistance Center remains closed through Sept. 5. Its employees have been teleworking through the storm.